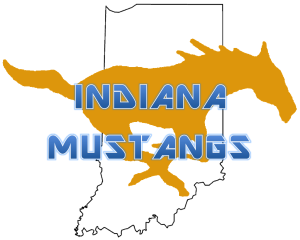 The Indiana Mustangs, who are members of the Elite MCFL, traveled to Cincinnati on Saturday afternoon to face the Cincinnati Jayhawks of the Gridiron Development Football League in the first round of the Mid-States Football Tournament. The Mustangs won 35 – 6, and will now advance to the secondround of the tournament. The Mustang offense was led by quarterback Travis Kempton, a former baseball pitcher at the University of Indianapolis, who threw four touchdown strikes on Saturday. Kempton’s first touchdown was an 8-yard pass to former Arlington High School standout James Sharp, who ironically is hoping to play both basketball and track at UIndy this year. On the next series, Kempton ran a bootleg and found a an open Carlos Avilia for a 56-yard scoring reception. Before the first half ended, Kempton connected again with Sharp for a 48-yard touchdown. Holder Russell Peterson ran in the two-point conversion, and the Mustangs led 22–0 at halftime. The Jayhawks were finally able to score on the stingy Mustang defense midway into the third period with a short touchdown reception. However, the Mustangs responded on their next drive with a 20-yard scoring reception to tight end Eric McKinney. In the 4th quarter, the Mustangs closed out the scoring with a one-yard touchdown plunge by fullback Dontae Hart, a former Ben Davis High School player. Although Kempton’s four touchdown passes were game highlights, the Mustangs featured a powerful rushing attack behind an offensive line averaging 360 pounds – a line that allowed Nick Jackson to lead the team in rushing with 90 yards on 16 carries. Defensively, the Mustangs were led by linebacker Dan Eason who finished the game with nine tackles, sack and two tackles for losses. The Mustangs will be back in action on Saturday, October 15th for the 2nd round of the Mid-States Football Tournament. The Mid-States Football Tournament is hosted by the National Football Events (NFE), and the team winning this regional tournament will have the option to play in a Bowl game scheduled in Florida during January 2012. This entry was posted in Cincinnati, Football, Indiana, Jayhawks, Kokomo, MCFL, Mustangs. Bookmark the permalink.